IT WAS GORE Vidal who called Ronald Reagan “the Acting President,” and it would be lacking in insight to regard this barbed tribute as merely disparaging. Another screen actor, David Niven, was serving in British Intelligence during World War II when he discovered a lieutenant in the Pay Corps named M.E. Clifton-James. James was another actor who, in addition to his painfully acquired thespian skills, possessed one special attribute that fitted him for a new role on a wider stage: he bore an uncanny resemblance to General Sir Bernard Montgomery, the designated ground forces commander of the forthcoming Allied invasion of Normandy. Niven noticed this. Since it was vital to distract German attention from the presence of the commander, organizing his invasion forces on the English Channel coast, Clifton-James was duly dressed up as “Monty’s double” for highly-publicized visits to Gibraltar or Algiers—anywhere but southern England. As Supreme Commander of the Allied forces in Normandy, Dwight Eisenhower brought other gifts to his job. Of course he knew that, along with his own dizzy promotion to this new position, a certain amount of self-promotion was appropriate. Key members of his staff had the task of seeing that Ike got as much favourable publicity in the Allied media, especially back home in America, as had been generated, especially in the British press, for the exploits of Monty. The point about Monty was that he was the man who had licked the legendary Rommel at the battle of El Alamein in November 1942. The actual encounter, in the wastes of a desert somewhere west of Cairo, mattered less than the fact that Rommel had been beaten by the forces of the British Empire, which had hitherto not been having a good war beyond simply surviving. Rommel was another poster boy; and El Alamein thus became the ultimate brand-image war, as well as the place where more than enough blood and toil and tears and sweat had been spilled in the sand. This last exchange is quoted by Peter Caddick-Adams in Monty and Rommel: Parallel Lives. It is a wonderful mine of information for fans of either general, but unfortunately this will not have the effect of doubling its sales, precisely because of the close overlap between the two constituencies. For virtually every member of the Monty fan club has a certain amount of respect for Rommel. In these unhappy days when Anglophobia is suddenly as vocal in the Federal Republic as Euroscepticism is in Britain, this mutual admiration must be one of the strongest bonds of Anglo-German friendship. Nor is this paradox of recent origin, or simply a product of postwar nostalgia. Both Churchill and Goebbels appreciated at the time that each had a potential advantage in talking up the stature of the opposing generals, since the real winnings would accrue to the side that won. By this test, the winner was clearly the man who subsequently became Viscount Montgomery of Alamein. His victory there, along with the Tunisian campaign that ensued—and of course Soviet resistance—belatedly turned the tide in the Allies’ favor. 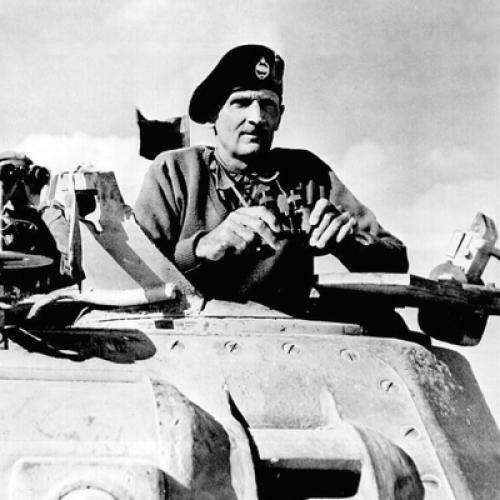 Thus the U.S. First Army’s gains at the other end of North Africa complemented the advance of the British Eighth Army, which fostered the legend underpinning Monty’s rise to the ground command of the Normandy invasion. By contrast, Rommel missed the beginning of the battle at El Alamein, and when he finally got there failed to turn the enemy in its tracks (as he had done before). Bested in North Africa, he was given a key role in the defense of Nazi-occupied France, in which his successes were tactical at best. Moreover, the famous Panzer general was rather too mobile for his own good, as he discovered when Allied aircraft knocked out his staff car and left him seriously injured on July 17, 1944, after only forty-one days of his own Normandy campaign. Three days later, the plot to assassinate Hitler failed, and Rommel was implicated, to an extent that remains controversial. By the time he was well enough to resume his duties, he was judged well enough also to face investigation and to be offered the option of suicide. Jealous of his honor and fearful for his family, he did the noble thing and shot himself on October 14. By then Monty had been relieved of overall command of Allied troops, with the consolation prize of a field marshal’s baton. Thus the personal duel in Normandy ended. The fact that it had been seen as such at the time—presented in the media as a rematch of the encounters in the western desert—justifies Caddick-Adams in pursuing his theme of a joint biographical study. He is a military historian of great industry who shows an impressive grasp of his materials, especially on the British side (though there is minimal citation of anything in German). He clearly decided not only to tell the story of the two generals’ epic contest in World War II, but also to go back to the beginning of their respective military careers in World War I. “These were not just formative years, but the deciding days in their careers,” Caddick-Adams claims of their experience. Maybe. Alternatively, a few flashbacks to the two protagonists’ early lives could have served here, with more economy and greater pertinence. Compared with his two heroes, Caddick-Adams unfortunately fails to deliver the goods with sufficient effect to justify all his labors in his first two hundred pages, many of which can be skipped without loss. All told, however, the author’s central purpose is achieved with impressive and cumulative success as his book progresses. It was certainly worth quoting a confidential report from 1931 on Lt Col. Montgomery, aged forty-four: “He is clever, energetic, ambitious, and a very gifted instructor. He has character, knowledge, and a quick grasp of military problems.” Well done, the good fairy at young Bernard’s cradle! And the legacy from the bad fairy was also apparent in 1931: “He must cultivate tact, tolerance and discretion.” Of course, he did no such thing, as was duly and repeatedly discovered later by the long-suffering Ike, who deserved a special Allied war-service medal for putting up with Monty’s outrageous behaviour, and for not prematurely depriving the British of their much-needed war hero. As for Rommel, Caddick-Adams comments that “Today he is better known than Monty.” Yet he professes to find it “perplexing” to account for “why Britain managed to talk up such a ruthless opponent.” His own book actually provides the essential materials for answering a question that was never much of a puzzle for Hemingway. For the more that Rommel’s generalship was praised, the greater became the achievement of Monty in beating him. If this was possible to acknowledge across “the havoc of war,” it was even easier after El Alamein and after the success of D-Day. Rommel lost in the end; that was what counted; all the rest was cabbage. Peter Clarke’s new book, Mr. Churchill’s Profession, will be published by Bloomsbury Press in 2012.